My standby for many uses. Like the ring pull tin, no need to look for can opener. The lid on top is handy when it stays on. This is handy to have in the pantry when an idea hits and is so much cheaper then Golden Circle. I buy this crushed pineapple for a particular recipe I make and it’s really nice and sweet. The price is good and the ring pull lid makes life easy. With the leftover pineapple which keeps really well for around 6 or 7 days someone usually puts it on tgeir cereal or icecream. 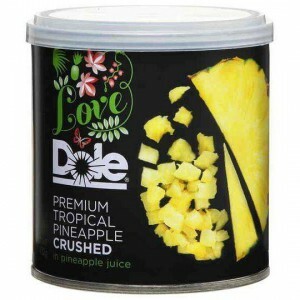 How would you rate Love Dole Premium Crushed Pineapple?